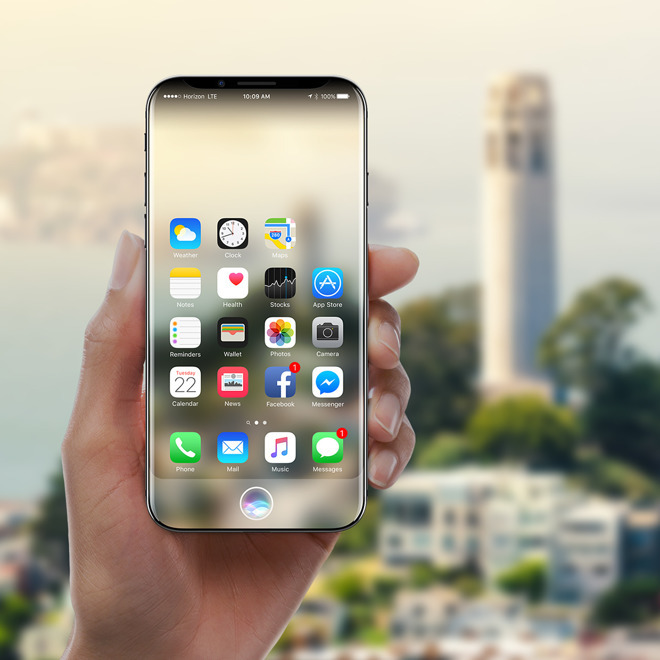 An "iPhone 8" concept render. "Related facilities" should break ground later in 2017, the Korea Economic Daily said on Monday, citing sources. It's expected that mass produciton will begin sometime in 2018. Flexible PCBs are considered essential for curved OLED panels on smartphones. Samsung has so far maintained the edge in the field, having used curved OLED on phones since 2015's Galaxy S6 Edge. Indeed this year's "iPhone 8" will allegedly use Samsung panels, despite Apple's tendency to distance itself from its main competitor. LG Innotek components will presumably have to wait for next year's "iPhone 9." The company could end up splitting orders with Samsung, even if it does win a contract. Rumors about that device —likely over a year away —have so far been scarce. It will almost certainly support 5G cellular, since Apple is already planning to test the technology. The "iPhone 8" should feature a 5.8-inch OLED display with an embedded Touch ID sensor, replacing a physical home button with a virtual one. Other upgrades should include an "A11" processor, wireless charging, faster cable charging, and 3D facial recognition.